No reason to make deal with Hamas which doesn't include soldiers' bodies, captive Israelis, Justice Minister Shaked says. 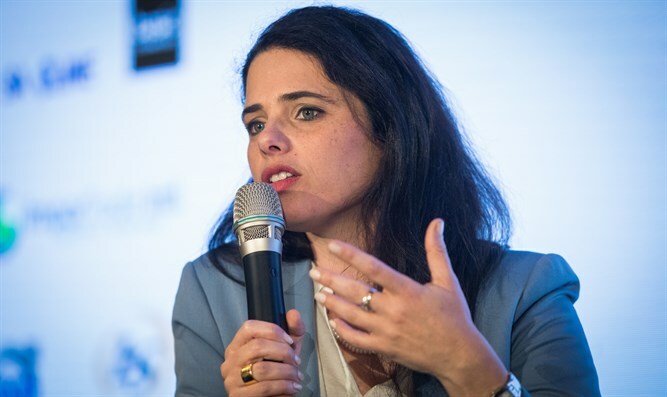 Justice Minister Ayelet Shaked (Jewish Home) on Sunday said that the Cabinet meeting regarding the proposed peace deal with Hamas does not need to lead to a practical decision. "The bottom line is that Egypt and the US are trying to mediate between Hamas and Israel," she told Kol Barama Radio. "We need to recognize the fact that Hamas is in charge in Gaza, and do what's right for Israel." Shaked added that there is no reason to reach an agreement with Hamas as long as Hamas refuses to discuss releasing the civilians and the bodies of the soldiers it currently holds. "I think that we don't need to reach any agreement without the captives and missing being returned [to us]," she said, adding that Israel "should not reach any agreement without stopping Hamas from becoming stronger." "We don't want to end up in a situation similar to when Israeli governments allowed Hezbollah to increase its strength on the border. We cannot allow a similar situation in Gaza. "The Israeli government needs to turn Hamas' hold on the soldiers' bodies and the civilians into a burden instead of a treasure. We need to make things harder for them, not easier." IDF soldiers Hadar Goldin and Oron Shaul were killed during a UN-initiated ceasefire during Operation Protective Edge in 2014. Since then, their bodies have been held by Hamas. Two additional Israelis, Avera Mengistu and Hisham al-Sayed - are believed to be held by Hamas as well. Both al-Sayed and Mengistu are believed to suffer from mental illness. The proposed Egyptian-brokered deal discussed on Sunday would not include a clause ensuring the return of any of the four Israelis. However, it would include providing the Hamas terror group with an airport, seaport, and additional power plants.